e is into experimenting within his craft’s boundaries, confronting the limits of the medium. She is concerned with pattern and texture. They both like to create typographic projects from complex arrangements. Suzanne Bakkum and Koos Breen met at the Royal Academy of Art in The Hague, the Netherlands, where they both studied Graphic Design and graduated last July (2014). Collaborate is their first project they collaborated on. Wallpaper magazine featured them on it’s Graduate Directory for 2015. “Today’s graphics graduates are faced with the daunting task of finding their feet in a field that has expanded way beyond the tactility of two-dimensional media into a digital realm of virtual space and interactivity” writes Jonathan Bell on the curated portfolio of excellence in Visual Communications. So when TYPEROOM asked them to reflect on this collaboration, they responded instantaneous. This is the story of their design partnership in their own words. "Hello! We are Koos Breen and Suzanne Bakkum. We met at the Royal Academy of Art in The Hague, the Netherlands, where we both studied Graphic Design and graduated last July (2014). Collaborate is the first project we collaborated on, way back in 2012. We were asked by Typeroom to reflect on this collaboration. K: How did we ever get started on this project? K: Oh, yeah. It was an assignment for Typography class, taught by Pieter Boddaert: design a poster based on one of the rules of the Incomplete Manifesto for Growth. S: You picked rule number 16. Collaborate: The space between people working together is filled with conflict, friction, strife, exhilaration, delight, and vast creative potential. You asked me if I wanted to collaborate with you. K: It was the perfect excuse to work together, because I thought you were the bomb. K: Haha. Don’t mess with me. S: I’m not messing with you, I’m being dead serious. K: We decided to create a poster every week, and they would represent different ways of collaborating. We gave ourselves one hour per step. S: Every week we would come up with a number of rules. We could design ‘freely’ within these rules and work separately from each-other. K: I think rules are necessary to be able to work together if you haven’t before. Otherwise it’ll turn into a battlefield. Which it did. S: It did! But maybe we should start at the beginning. K: The first poster, I don’t even want to look at it. It was so bad. Unbelievable. Are we really publishing this? S: It’s so bad! Looking back I like the sketches better than the final result. Which rules did we apply to this one? K: We agreed we wouldn’t see each other’s work in advance. 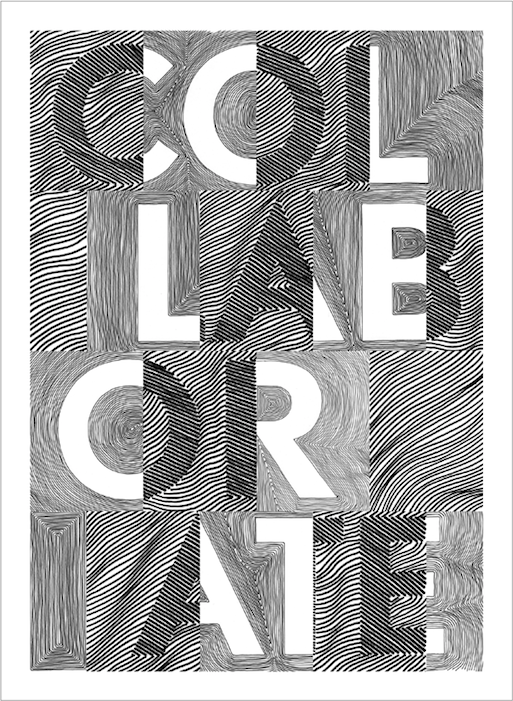 We would both make a sketch of the word “collaborate”, and then just superimpose them. Something we wouldn’t usually do. We didn’t really collaborate. We just hoped the two layers would create something cool together, but the result was saddening. But yeah – how could you make a good poster in a couple of hours? S: I believe you can make a good poster in a couple of hours, but it’s a big gamble for each to make typographic posters separately and then superimpose them. The result wasn’t well-thought-out, and what came out was totally random. S: Anyway, on to the second poster. K: The second poster had us warring. I think we had agreed that one of us would start, work on it for an hour, email it, and then the other would work on it for an hour and send it back. We would do this four times and then it would be finished. But we hadn’t talked about whether or not we could undo each other’s steps. S: You took the first step; deciding the typo should read COL LAB OR ATE which was something from the first poster. We stuck to that. K: I like weird breaks. S: And those Sottsass portfolio patterns. K: Oh, yeah, I wanted the typography to take shape from that pattern. Were you the one that brought in the depth? K: What? Then what did you do? S: Hahaha, I made outlines of the Sottsass pattern – in the second step. K: Yeah! That was a good step. S: You applied depth in the third step, and then I smashed that poster to pieces, remember? You know why? K: Oh man, I hated when you did that. I didn’t get it at all. S: It’s because I had kerned the letters, but you didn’t keep that in step 3. K: Hahahaha, seriously? You cut up the poster because I didn’t pay attention to you?! Haha!! So you messed it up. I never understood. I thought it was a serious step. S: It sort of reminded me of glass anyway, so I thought it would be cool to smash it to pieces. Also visualizing part of the rule – “(...) working together is filled with conflict, friction (...)”. But in the end we chose to go with the poster from step 3, with just the depth. I thought that was the best one out of that week’s versions, because you really get sucked into the poster. K: I think a simple idea usually works the best. S: Yeah exactly, don’t put too many ideas into one poster. S: Okay on to poster 3. K: It was a good one. I still like it a lot, even after two years. S: Yeah, I agree. I think it’s the best one in the series, because it strongly visualizes the “collaborating”-element in one image. K: First we took the basic typography we had established in the first 2 posters and cut the poster into pieces and numbered them. You got the odd numbers, I got the even numbers. Then we were free to do what we both wanted. We had two rules: we had to draw on the pieces by hand, and it had to be black and white. S: So we didn’t know what the other would do. K: It was hilarious when we saw what the other had done. You had done almost exactly what I had, except with a chunky marker. S: Yeah, and a little less precise than you. I remember at first I didn’t feel very confident of my solution. I thought it was pretty crappy, but when we matched up all the pieces it really all came together. K: It already looked pretty good in black and white, but it was still kind of boring maybe. So we both made a new digital version with the analog black and white one as a base. S: It was exciting to play around with. The combination of analog and digital is not something self-evident. I’m not sure I how to explain. Koos? K: Nearly everyone works digitally. That means the computer also dictates the form. This doesn’t have to be a problem, but a lot of things start to resemble one another because of it. The signature, the hand of the artist tends to get lost in the process. When you make analog work and apply it in a poster, your work looks more specifically yours, it bears your hand. S: Exactly. I always think it’s a shame when you can look at a poster and tell what software was used to make it. Unless it’s someone who is actually trying to find the limits of the software and break them. If someone is applying the software in unexpected ways, they’re really influencing the process and outcome. Pushing the boundaries of design. K: Haha. But not always. That last poster (no. 4) we did together is crap. What do you think? S: I think it was a fun experiment, which resulted in something fun, but it’s not finished. That last poster never really became a finished poster, it looks like a sketch. K: Now it’s just an Illustrator gimmick. And even with those terrible fake letters that were so fashionable a few years ago. K: Haha, maybe you did. I definitely did not. K: The idea was just too convoluted. That never works. Keep it simple. S: Maybe we should explain what the idea was. K: I don’t know if I can. We can try. S: We both reduced typography to its vector points, and sent these to each other. The idea was to reconnect the vector points and develop new typography. But we didn’t manage much more than that, it still needs another step. K: Now it just feels forced. But Suus, are we seriously letting all of these posters get published? Even though we don’t even like some of them? S: There’s one that we do like, right? I think it’s cool to show people the other stuff and that it’s really an experiment – they also get to see the failures. K: It’s interesting to see how the project’s title is reflected in the process. S+K: We had fun collaborating together on this project and it was good to look back. Maybe next time we can reflect on something more recent ;) we worked together on several other projects since. So feel free to have a look on our websites.